The 32' fiberglass extension ladder has a load rating of 300 lbs. and is constructed with heavy duty side rails and rungs. Fiberglass, though heavier than aluminum, is non-conductive, which allows you to work near electricity. The maximum working length fully extended is 29', as per the manufacturer, and the ladder weighs approximately 80 lbs. 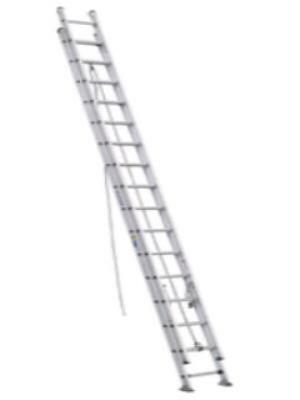 An aluminum 32' extension ladder is available at our Hillsdale location, which weighs approximately 60 lbs. * Please call us for any questions on our ladder 32 foot extension rentals in Hillsdale and Ridgewood NJ.